This is the second of two posts about the lives of Tangut officials who defected to the Mongols during the Mongol conquest of China (1206–1271), and the careers of their descendants during the succeeding Yuan dynasty (1271–1368), as recorded on two steles discovered in Hebei province fifty years apart. Last week I discussed a stele erected in 1350 to commemorate a Tangut official called Laosuo 老索 (1188–1260) and four generations of his family that was discovered in Baoding 保定 in 1985. This week I am discussing a stele erected in 1278 to commemorate a Tangut official called Xiaoli Qianbu 小李鈐部 (1191–1259) and three generations of his family that was discovered in Daming 大名 (the Northern Capital 北京 of the Northern Song), on the southern border of Hebei, in 2013. In September 2013 a stele and its associated tomb were discovered during work at a building site on the south side of Chenzhuang Village 陳莊村, just to the east of Daming town. The local authorities were informed, and an archaeological survey and rescue excavation were carried out. In addition to the stele, a sacrificial stone tablet engraved with patterns and a pair of drum-shaped stone stools were found in the tomb. The tomb is one of a number of tombs that have been discovered in the area (just east of where the Daming city walls once stood), and in March 1990 the stele of Li Ailu 李愛魯, Xiaoli Qinbu's eldest son, was also discovered in the viscinity. Unfortunately I have not see any photos of this stele, or rubbings or transcriptions of its epitaph. A two-day conference with about twenty experts was held at the end of March 2014 to study the stele and its inscriptions. 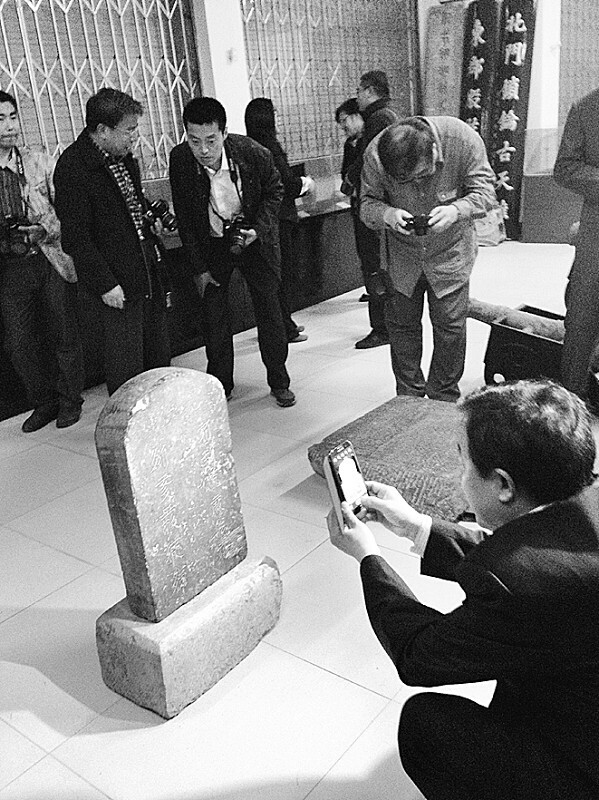 The conference recommended that the area of tombs be protected from further development, and a detailed survey be carried out in case there are still more Yuan dynasty steles or artefacts waiting to be discovered. The stele is quite small in size, only 60 cm high, 35 cm wide, and 11 cm thick, with a plain stele base (32 cm high, 47 cm wide, and 265 cm thick) but no stele head. On one side is a Chinese inscription of 477 characters in 21 lines, while on the other side the names of Xiaoli Qianbu and his wife are recorded in a short Tangut inscription of eleven characters in two lines. Above the Chinese inscription is a heading in Chinese seal script characters. There is some damage to the bottom right of the Tangut side of the stele, perhaps where a mechanical digger scraped its surface, but luckily the Tangut text is still entirely legible. Given the undoubted historical importance of the persons commemorated on the Daming Stele, it is more than a little suprising that it is so small and its epitaph so terse. The Stele of Laosuo is 3.85 m high and has an incomplete inscription of 1,172 surviving characters; and the 1361 Suzhou Stele, which commemorates Xiaoli Qianbu's elder brother's branch of the family, is 2.36 m high (with a missing stele head) and has an inscription of about 1,000 characters. 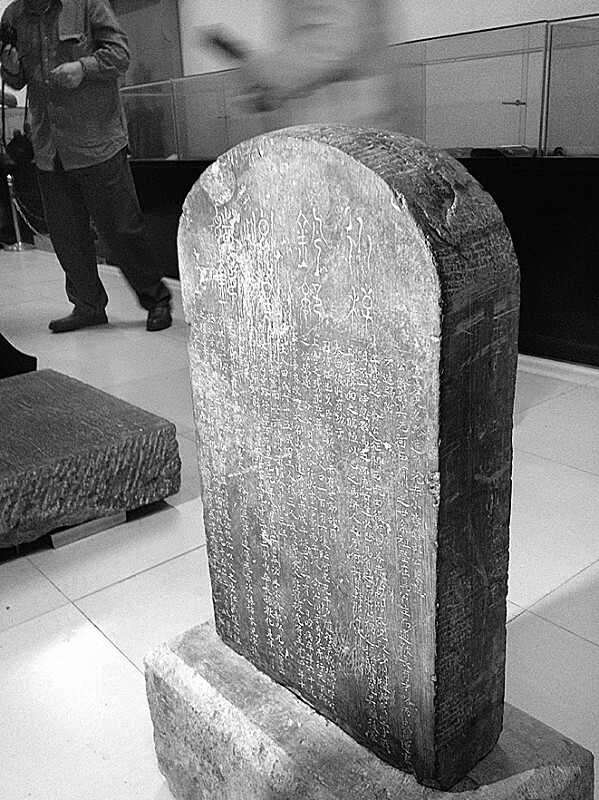 In contrast, the Daming Stele is only 60 cm high, with a main inscription of only 477 characters. Moreover, the inscription only gives a very brief summary of the lives of Xiaoli Qianbu and his descendants, and omits many of the details found in other historical sources. It seems to me to be almost inconceivable that this modest memorial stone was erected as the primary public monument for such an important official as Xiaoli Qianbu. On the other hand, it is a good quality stone and the Chinese and Tangut calligraphy are both very fine. I believe that this small-sized stele, with an abridged epitaph on one side and the names of the two tomb inhabitatants (Xiaoli Qianbu and his wife) on the other side, was specially commissioned in order to be placed inside the tomb for ritual purposes. I am sure that there would once have been a large stele, of a similar stature to the Suzhou Stele or the Stele of Laosuo, with a full-length epitaph, erected outside of the tomb for the benefit of the public at large, but that has either been destroyed or is buried in the viscinity, still awaiting discovery. Ah! In one family the titles are inherited, branch and leaf are not replaced. Without the accumulated merits and many deeds of the grandfather, how could it come to this?! The eldest grandson, Jiaohua, because his father had gone to serve [in Yunnan] but had not yet returned, was concerned that his grandfather's coffin had not been interred.¹⁸ Therefore he geomantically selected a new burial spot, and carved a memorial stone to record [his deeds] for posterity. Recorded by the Grand Master for Excellent Counsel, Darughachi of Daming Route, and Darughachi of military provisions, the filial eldest grandson Jiaohua, on the 5th day of the 2nd month of the 15th year of the Zhiyuan era [27th February 1278]. 1. The Historical Records of the Mongols and the New Yuan History both state that Xiaoli Qianbu's ancestor had been bestowed the Tang royal surname of Li 李, but to distinguish themselves from the Western Xia royal family, who had also been bestowed the Tang royal surname of Li 李, they changed their surname to Xiaoli 小李 "Little Li", which later became corrupted to Xili 昔里 (which is the form of his name given in the Yuan History). Xiaoli Qianbu's father, Xiaoli Qianbu, and Xiaoli Qianbu's son (Ailu) were all posthumously given the honorary feudal title of Duke of Wei 魏國公 (and their wives Lady of Wei 魏國夫人), Daming being located in the ancient state of Wei. Xiaoli Qianbu is himself referred to as Duke of Loyal Offering 貞獻公 in some sources. 2. The Historical Records of the Mongols and the New Yuan History both state that Xiaoli Qianbu's ancestors were Shatuo Turks who eventually settled in Shazhou (Dunhuang) after the fall of the Tang dynasty (618–907), and became assimilated into the Tangut people. The family had served the Western Xia as officials and ministers for seven generations, and Xiaoli Qianbu's father, Darsha 達爾沙 or Dajiasha 答加沙, had the title of beki, and was Qianbu (Army Commander) of Suzhou (Jiuquan). His wife was a Madam Liang 梁氏, and they had four sons, including Xiaoli Qianbu, who Wang Yun records was also called Yilishan 益立山. 3. According to the Historical Records of the Mongols and the New Yuan History, in the mid 1220s Xiaoli Qianbu was Qianbu of Shazhou, whilst his eldest brother (called Julisha 舉立沙 on the Suzhou Stele, but named as Xili Dushui 昔李都水 by Cheng Jufu) was Qianbu of Suzhou. In 1226, when the Mongols were besieging Suzhou, Xiaoli Qianbu's brother sent a secret letter to the besiegers, offering to surrender, but his plan was discovered and he was killed by the other defenders. Because his elder brother had been killed by the Tangut defenders, and perhaps fearing for his own life as the brother of a traitor, Xiaoli Qianbu defected to the Mongols (as Shazhou was not attacked by the Mongols until the following year, he apparently left Shazhou and went to Suzhou to pledge his allegiance to Genghis Khan). The killing of Xiaoli Qianbu's brother is presumably the family misfortune obliquely referred to in the Daming Stele inscription. The lives and careers of Julisha and his descendants are recorded on the 1361 Suzhou Stele. According to the stele, Genghis Khan made Julisha's son, Asha 阿沙, hereditary Grand Darughachi (Yeke Darughachi 也可達魯花赤) of Suzhou in reward for his father's plan to change allegiance to the Mongols. 4. The transcriptions of the Chinese epitaph that I have seen all give 征辟西 "campaign west of Pi", which makes no sense to me, as I know of no place called Pi 辟 (闢 in traditional form). 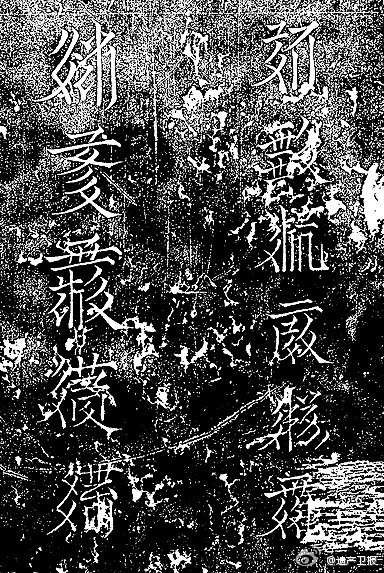 The character transcribed as 辟 clearly has a gate radical in the rubbing but it is not possible to see whether it really is the character 闢 or not from the low resolution image of the rubbing I have seen. It seems to me that the character should be guan 關 "pass", referring to the Jiayu Pass, which is immediately west of Suzhou. My translation follows this interpretation. 5. The word "adachi" 阿答赤 before the name Khutugh Temür 忽都帖木兒 is the Mongolian title for the official in charge of breeding horses (Mongolian aɣtači ᠠᠭᠲᠠᠴᠢ, usually transcribed in Chinese as 阿黑答赤), which is sometimes under-translated in English as "groom". 6. According to the Yuan History (see translation below), Xiaoli Qianbu was sent to pacify Suzhou after taking Shazhou, but as the city would not surrender Genghis Khan wanted to massacre the inhabitants. However, Xiaoli Qianbu pleaded with him to save the lives of his elder brother and his family who were among the defenders. When the city finally fell, Genghis Khan spared the lives of Xiaoli Qianbu's brother and one hundred and six members of his household. On the other hand, the New Yuan History does not mention a second siege of Suzhou, but states that when Shazhou would not surrender Xiaoli Qianbu pleaded with Genghis Khan not to massacre the inhabitants because it was only one or two generals who were holding out, and furthermore many of his relatives were among the city inhabitants; so when the city fell, one hundred and six members of Xiaoli Qianbu's family were spared. Clearly the account in the Yuan History is incorrect, and conflates the failed surrender of Suzhou by Xiaoli Qianbu's brother in 1226 with Xiaoli Qianbu's participation in the taking of Shazhou in 1227. Although the Daming Stele epitaph does not explain who the one hundred and six people were and where they came from, the explanation in the New Yuan History that they were his relatives residing in Shazhou makes sense, as he was Qianbu of Shazhou before he joined the Mongols. 7. According the Historical Records of the Mongols, the attack on the city of Aksu took place during the winter of 1238, when Xiaoli Qianbu led ten men on a suicidal attack on the city (see Yuan History account below). He was rewarded for his bravery with the title Baghatur or Ba'atur ᠪᠠᠭᠠᠲᠤᠷ "Hero". 8. The Historical Records of the Mongols also puts his appointment as a judge with Mahmud Yalavach in 1246, as well as specifying that the appointment was held in Yanjing 燕京 (modern Beijing), the future capital of the Yuan dynasty. However, the New Yuan History puts the appointment six years earlier, in 1240. From the Daming Stele epitaph it seems likely that he was made Judge (Mongolian Jarquchi) in 1240, and promoted to a Grand Judge (Mongolian Yeke Jarquchi) in 1246. The Yuan History specifies that Xiaoli Qianbu worked with Bujir rather than Yalavach—Bujir and Yalavach were two of the six senior officials in the administration of China based at Yanjing. 9. The Yuan History account is rather confused, suggesting that Xiaoli Qianbu was made Darughachi of Daming Route in 1246, but was subsequently ordered to take an administrative position, and only when that appointment was over was he sent to Daming. On the other hand, Wang Yun states that Xiaoli Qianbu was ordered to to take up an administrative post in the Branch Department of State Affairs at Yanjing in 1244, and only appointed as Darughachi of Daming Route in spring 1251, which accords with the Daming Stele epitaph. 10. According the Yuan History, Xiaoli Qianbu was responsible for providing provisions for the Mongol army under Kublai Khan during the Mongol campaign against the Southern Song in 1259, but he fell ill and had to return home, where he died. Cheng Jufu and Yao Sui state that his body was sent back to Suzhou for burial among the ancestral graves (and according to Yao Sui a cenotaph was built in Daming for ease of annual sacrifices). However, the Daming Stele epitaph indicates that this did not happen, and his coffin was temporarily kept in Daming until his grandson Jiaohua decided to bury him in Daming, at the place where his stele was found. 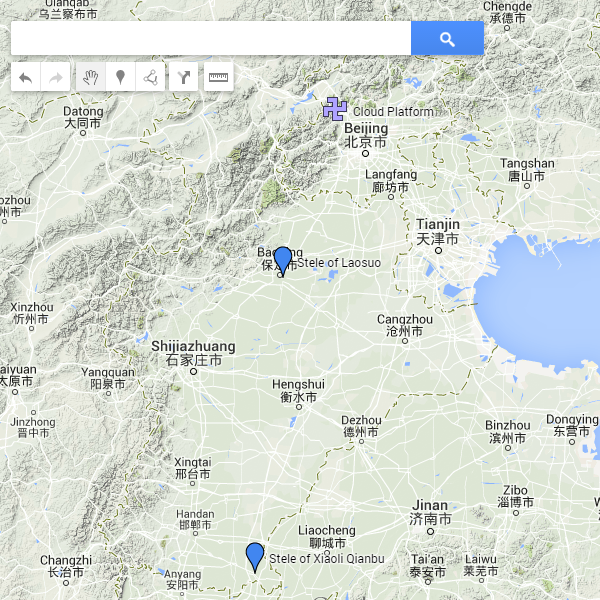 Wang Yun is the only source that records the site of his burial, which he gives as the new burial ground (新阡) at Taitou Village 台頭里 in Daming County. 11. The Daming Stele records that Xiaoli Qianbu died on the 28th day of the 7th month in the cyclic year wuwu (Year of the Earth Horse) , aged 69, whereas the Yuan History, Wang Yun and Yao Sui all record that Xiaoli Qianbu died the following year, in the cyclic year jiwu (Year of the Earth Goat) , also aged 69 (Wang Yun records the date as the 7th month, whereas Yao Sui gives the date as the 28th day of the 7th month). I am reluctantly forced to suppose that the Daming Stele epitaph is mistaken, and that Xiaoli Qianbu died on the 28th day of the 7th month in the cyclic year jiwu (Year of the Earth Goat) [18th August 1259]. Cheng Jufu alone gives his age at death as 62 rather than 69. 12. All sources agree that Xiaoli Qianbu's wife was a Madam Tian 田氏, and that she had three sons named Ailu, Luohe and Xiao Qianbu. Wang Yun alone records a second wife, Madam Bai 白氏, and he states that both wives were buried with Xiaoli Qianbu. 13. Ailu inherited his father's position as Darughachi of Daming Route, but he did not keep it for long. According to the Yuan History, in the 7th month of the 4th year of the Zhiyuan era  "Ailu, Darughachi of Daming Route, and Zhang Hongfan, Supervisor-in-chief, misappropriated official funds, and were removed from their positions" 大名路達魯花赤愛魯、總管張弘範等盜用官錢，罷之 (ch. 6). This offence is not recorded in any of the epitaphs, and it can be assumed that his being sent south never to return was a punishment rather than a promotion. 14. The Yuan History gives a detailed account of Ailu's twenty years participating in the Mongol campaigns against the tribes of southwest China and modern Vietnam, and records that he died of miasma in army service in 1288. Yao Sui additionally states that he was 63 years old when he died on the 18th day of the 6th month in the cyclic year wuzi (Year of the Earth Rat) [17th July 1288], which would mean he was born in 1226. On the other hand, Cheng Jufu records that he was 57 years old when he died, which would mean that he was born in 1232. 14. None of the historical sources give a reason for Luohe's death, and the Daming Stele epitaph is the only source that gives his date of death. 16. After the disgrace of Ailu, and because Luohe had died two years previously, Xiao Qianbu (Young Qianbu) inherited the position of Darughachi of Daming Route in 1264. He managed to keep it somewhat longer than his elder brother, but according to the Yuan History, in the 1st month of the 13th year of the Zhiyuan era  "Xiao Qianbu, Darughachi of Daming Route, was executed for taking bribes, and his property was confiscated" 大名路達魯花赤小鈐部坐奸贓伏誅，沒其家 (ch. 9). The Daming Stele is understandably silent on the cause of his death. 17. There is some disagreement between sources on the names of the three grandsons of Xiaoli Qianbu. Wang Yun records their names as Jiaohua, Temür and Wannu, which accords with the Daming Stele epitaph. However, Cheng Jufu records that Ailu's wife was a Madam Wang 王氏, and that she had three sons and three daughters. The three sons were Jiaohua, Esen Temür 也先帖木兒, and Qutudai 骨都歹. The three daughters were Xizhi 西止, [unknown], and Esen Ter 也先帖兒. Yao Sui records Ailu's wife as Madam Wang, but does not give their children's names. 18. In Ailu's absence, and following the execution of his uncle, Jiaohua had been made Darughachi of Daming Route, and was acting head of the family. He was therefore responsible for the body of his grandfather, which had presumably being resting in Daming for twenty years waiting for an opportunity to be taken back to Suzhou for burial, and made the sensible decision to bury him locally. It seems from all the sources that Jiaohua managed to finish his career without disgracing his family. To help flesh out some of the details of the careers of Xiaoli Qianbu and his descendants that are omitted in the Daming Stele inscription, most of the biography of Xili Qianbu in the Yuan History (ch. 122) is translated below. Xili Qianbu was a Tangut from the Xili family. Qianbu [Kempu] is also called Ganbu [Gambu]—the pronunciation is similar and they are mutually interchangeable. During the time of Emperor Taizu [Genghis Khan] (r. 1206–1227) the Western Xia submitted to be a vassal, and the great army [of the Mongols] went off to the west, but then [the Western Xia] had second thoughts. When the emperor heard this he turned his army about in order to deal with them. He ordered Qianbu to go with Khutugh Temür to offer to accept the surrender of Shazhou [modern Dunhuang]. The city pretended to surrender, and they prepared meat and wine to welcome the [Mongol] army, but had troops waiting in ambush. When the Commander arrived the ambush was deployed and [the commander's] horse was tripped up. Qianbu gave the Commander the horse he was riding and sent it galloping away, while he himself rode the horse that had been tripped, and bringing up the rear he attacked and defeated [the defenders]. Another day the emperor asked him: "You were facing death, but changed horses with someone else—why did you do this?" Qianbu replied: "If your humble subject dies in battle it does not matter; but the Commander is your majesty's tried and trusted general who could not be lost." The emperor considered him loyal. [The Mongols] advanced their troops to surround Suzhou [modern Jiuquan]. Qianbu's elder brother was one of the defenders [of Suzhou], so fearing that the city would fall and disaster would befall his family, [Qianbu] was the first to volunteer [to attack the city]. The emperor was angry that after a long time the city still had not fallen, and gave an order to massacre everyone [in the city]. Only when he heard Qianbu plead for his family members at the place of execution did he free one hundred and six persons from the death sentence, and returned their lands and property. In the cyclic year yiwei (Wood Goat Year)  [the future] emperors Dingzong (r. 1246–1248) and Xianzong (r. 1251–1259) were both princes of the imperial family, and they campaigned against the western regions with Subutai (1175–1248). The following year when they set off, Qianbu was also in the army. The year after that they arrived at the Caspian Sea, and Qianbu followed the prince Batu as he campaigned against Russia. When they reached Ryazan they fought a great battle for seven days before taking the city. In the 11th month during winter of the cyclic year jihai (Earth Pig Year)  they reached Aksu, which was stoutly defended and for a long time could not be taken. During the 1st month in the spring of the following year, Qianbu led a suicide squad of ten men. They climbed up scaling ladders before anyone else, captured eleven men, and shouted out: "The city has fallen! ", whereupon the host swarmed over the walls and took the city. He was rewarded with a horse from the west and silk from the west, and given the title Baghatur (meaning "Hero"). The following year, the forces returned home, and Qianbu was was promoted to a Battalion Commander, and he was presented with a coloured military robe for use as a banquet robe for all seasons. Soon after he was made a judge. In the cyclic year bingwu (Fire Horse Year)  Emperor Dingzong ascended to the throne, and [Qianbu] was promoted to Darughachi of Daming Route. As Bujir had come to the Branch Department of State Affairs Emperor Xianzong ordered Qianbu to share office with him. Afterwards he was also given a tiger tally, and sent to govern Daming. In the cyclic year jiwei (Earth Goat Year)  when [the future] Emperor Shizu campaigned in the south [Qianbu] provided provisions for the army, which never ran short. Because of illness he returned in a carriage, and died at home, aged sixty-nine. His son was called Ailu. Ailu inherited the position of Darughachi of Daming Route. During the 5th year of the Zhiyuan era  he went with the Prince of Yunnan [Hugechi] on a campaign against the Golden Teeth tribes. ... [long section not yet translated] ... In the 25th year  he contracted miasma and died. He was granted the title Manager of Governmental Affairs, and given the posthumous name Bold and Agile. His son, Jiaohua, was Manager of Governmental Affairs at the Secretariat. He petitioned the court, and they granted his grandfather Xili Qianbu the title of Grand Preceptor, and gave him the posthumous name Loyal Offering; and promoted Ailu to Grand Preceptor, posthumously enfeoffed him as Duke of Wei, and changed his posthumous name to Loyal Integrity. See Bibliography at the bottom of this post for a list of epitaphs that have been used as sources for the family tree. The circled numbers indicate the line of succession as Darughachi of Daming Route. 1. Yuli Zhijizhu was the eldest of three brothers, but the name of their father is not recorded. The Tomb Epitaph for Xili Bo states that Yuli Zhijizhu was a Military Commissioner (經略使) for the Western Xia. His descendants were: Shunanyu Ganbu 束南玉紺部 [Yuli Zhijizhu's son]; Xiaoli Yugong 小李玉公 [Shunanyu Ganbu's son]; Qihedaha 乞合答哈 (?–1292) [Xiaoli Yugong's son]; Yilianzhen 益憐真, Xili Bo 昔李勃 [Qihedaha's sons]; Dao'an 道安 [Xili Bo's son]; Guanseng 觀僧 [Dao'an's son]. 2. Darsha's name is also recorded as Dajiasha 答加沙. One source records that he had four sons, but only the names of two are known, so the other two are omitted from the tree. 3. In one source Julisha is named as Xili Dushui 昔李都水. His son was made hereditary Grand Darughachi of Suzhou following Julisha's death during the siege of Suzhou in 1226, and the details of his descendants are recorded on a bilingual Chinese-Uighur stele erected in Suzhou 肅州 (modern Jiuquan 酒泉 in Gansu) in 1361. The stele was subsequently broken in half to form two pillars, and embedded into the inside walls of the east gate of the city wall when the city walls were rebuilt in 1395, and it was only rediscovered in 1962. His descendants were: Asha 阿沙 [Julisha's son]; Lama Duo'erzhi 剌麻朵兒只, Guangu'erjiage 管固兒加哥 [Asha's sons]; Guan[...] 貫□□□, Eryu 耳玉, Guanbu 管布, Lingzhisha 令只沙 [Lama Duo'erzhi's sons]; Tiexinpu 帖信普 [Guan[...]'s son]; Puda Shili 普達實理, Shanju 善居 [Lingzhisha's sons]; Wanzhe Tiemu'er 完者帖木兒, Chijin Tiemu'er 赤斤帖木兒 [Tiexinpu's sons]. 4. Xiaoli Qianbu's name is transcribed as Xili Qianbu 昔里鈐部 in the Yuan History and some other sources. Some sources state that Xiaoli Qianbu's original name was Yilishan 益立山 or Jilisha 疾利沙. 5. Ailu's three sons are named as Jiaohua, Temür and Wannu in some sources (including the Daming Stele epitaph), but as Jiaohua, Esen Temür and Qutudar in other sources. Ailu also had three daughters, named in one source as Xizhi 西止 (who married Bayuete 巴約特), [unknown], and Esen Te[mü]r 也先帖兒 (who married Ardan 阿爾丹). It seems unlikely that Ailu had a son and daughter with the same name (Esen Temür), so perhaps the son was called Temür and the daughter Esen Temür. 6. Qutudai's name is also given as Qutudar 忽都答兒 or Qutuqdar 呼圖克岱爾. He is not mentioned in the Daming Stele epitaph so must have been born between 1278 and 1288. 7. It is not certain whose son Wannu was. He may have been Xiao Qianbu's son, and was adopted by Ailu after the execution of his father in 1276. 8. Madam Weimi is the only member of this family tree who has a definite Tangut name. The Chinese transcription of her name probably represents the Tangut royal family name Ngwemi, 缨熟 [ngwe² mi¹], normally transcribed in Chinese as Weiming 嵬名 (see Jacques 2010 for discussion of this name). 9. Yeshu Puhua had six sons (Yulisha, Sheliwei, Puyan, Sengqienu, Liandesha, Borenu) and three daughters (Hudutie, Yexian Tieni, Baoshounu). K0518 thi̭e¹ Transcription character for Chinese 田 (MSM tián, OM ꡈꡠꡋ ten) "field" (and a Chinese family name). Also used to phonetically transcribe similarly-pronounced Chinese characters such as 天 (MSM tiān, OM ꡉꡠꡋ tʰen); 甜 (MSM tián, OM ꡈꡠꡏ tem); 殿 (MSM diàn, OM ꡊꡠꡋ den); 電 (MSM diàn, OM ꡈꡠꡋ ten); 廷 (MSM tíng, OM ꡈꡞꡃ tiŋ); 定 (MSM dìng, OM ꡊꡞꡃ diŋ). K2588 źi̭ə̣¹ "family name of a female", equivalent to the Chinese word 氏 (MSM shì, OM ꡚꡞ ši). K4954 xu¹ Transcription character for Chinese 富 (MSM fù, OM ꡤꡟꡓ fuw) "wealthy". Also used to phonetically transcribe similarly-pronounced Chinese characters such as 福, 府, 符, 夫, 甫, 駙, 扶, 服, 腹, 父, 斧, 伏, 敷, 傅, 鳧, 輔 (MSM fu, OM ꡤꡟ fu); 浮, 婦 (MSM fú, OM ꡤꡡꡓ fow); 縛 (MSM fù, OM ꡤꡓ faw); 虎, 呼 (MSM hu, OM ꡜꡟ hu); 鳳 (MSM fèng, OM ꡤꡟꡃ fuŋ). K2003 źi̭e¹ Transcription character for Chinese 爾, 耳, 兒 (MSM er, OM ꡔꡞ ži). K1909 ꞏa A character added in front a kinship word for someone who is of an older generation (e.g. mother or father) or who is of the same generation but older (e.g. elder brother or elder sister). K1425 seɯ² Transcription character for Chinese 小 (MSM xiǎo, OM ꡛꡦꡓ sėw) "small". Also used to phonetically transcribe similarly-pronounced Chinese characters such as 霄, 簫 (MSM xiāo, OM ꡛꡦꡓ sėw). B2 蝾 L1142 li̭e² Transcription character for Chinese 李 (MSM li, OM ꡙꡞ li) "plum" (and a common Chinese family name). Also used to phonetically transcribe similarly-pronounced Chinese characters such as 利, 吏, 禮, 里, 歷, 麗, 鯉, 蠡, 隸 (MSM li, OM ꡙꡞ li). K0673 khwei² "big, great"; doubtfully a borrowing from Chinese 魁 (MSM kuí, OM ꡁꡟꡠ kʰue) "chief" according to Li Fanwen. * 'L' references are to Li Fanwen's 2008 Tangut-Chinese Dictionary; 'K' references are to Kychanov's 2006 Tangut Dictionary. ** Reconstructed readings are by M. V. Sofronov, as given in Kychanov's 2006 dictionary. The mouseover text gives the index number for the character in Sofronov's 1968 Grammar of the Tangut Language. A1 [thi̭e¹] is the Tangut transcription of 田 (MSM tián, OM ꡈꡠꡋ ten), literally "field", but here representing a relatively common Chinese family name. A2 [źi̭ə̣¹] is a Tangut word meaning the "family name of a female", equivalent to Chinese 氏 (MSM shì, OM ꡚꡞ ši), which is placed after the family name of a woman (either the Tangut transcription a Chinese family name or a native Tangut family name). These two characters are thus equivalent to Chinese tián shì 田氏, meaning "Madam Tian". "Madam Tian" is the name of Xiaoli Qianbu's wife given in the Daming Stele epitaph, as well as in various historical sources (Wang Yun, Yao Sui, and Cheng Jufu). A3 [xu¹] and A4 [źi̭e¹] are both Chinese transcription characters, the former normally transcribing Chinese characters that are pronounced fu in modern Mandarin, and the latter transcribing Chinese characters pronounced er in modern Mandarin. It has been suggested that the two characters transcribe Chinese 夫人 (MSM fū rén, OM ꡤꡟ ꡔꡞꡋ fu žin) "lady", but I think that there are a couple of problems with this interpretation. Firstly, in Chinese, the title "lady" furen would be expected to be placed directly after the family name, and not after a family name postfixed with "female family name" (氏), and as the Tangut text is a transcription of Chinese we would expect Tian furen (田夫人) rather than Tian-shi furen (田氏夫人). As there are no other examples of the Tangut transcription of Chinese "lady" furen that I know of, we cannot be sure that the latter construction is not acceptable in Tangut, but the very fact that there are no other examples throws this interpretation in doubt. However, the main obstacle to reading A3 and A4 as Chinese "lady" furen is that A4 is a poor phonetic match for Chinese ren. A4 is only ever attested transcribing Chinese er (OM ži), and not Chinese ren (OM žin). Moreover, there is a Tangut character, 界 [źên], which is widely used to transcribe Chinese 人 rén "person", so why use A4, which is not a good phonetic match ? My theory is that A3 and A4 are intended to represent the Chinese given name of Madam Tian. I think that the first character probably represents Chinese 富 (MSM fù, OM ꡤꡟꡓ fuw) "wealthy" or 福 (MSM fú, OM ꡤꡟ fu) "good fortune", while the second character represents Chinese 兒 (MSM ér, OM ꡔꡞ ži). The given names of Chinese women during the Yuan dynasty are rarely recorded, but ér was a very common second character in two-character female given names during the Ming dynasty, for example half the female characters in the 16th century novel Jin Ping Mei 金瓶梅 have given names that end in 兒 (e.g. Li Ping'er 李瓶兒). I therefore suggest that A3 and A4 represents the Chinese female name Fu'er (富兒 or 福兒). A5 and A6 thus form a respectful form of address to Madam Tian as the mother of the family. B1 [seɯ²] and B2 [li̭e²] are phonetic transcriptions of the Chinese characters used to write Xiaoli Qianbu's family name on the Daming Stele, 小 (MSM xiǎo, OM ꡛꡦꡓ sėw) "small" and 李 (MSM lǐ, OM ꡙꡞ li) "plum". The latter character is a common Chinese family name, and was the family name of the emperors of the Tang dynasty (618–907). According to the early 20th century histories, Historical Records of the Mongols and the New Yuan History, Xiaoli Qianbu's ancestors had been bestowed the Tang royal surname of Li 李, but when they later migrated to the Western Xia region they prefixed their family name with the word "small" (Chinese 小 xiǎo) in order to distinguish themselves from the Western Xia royal family, who had also been bestowed the Tang royal surname of Li 李. Thus their family name was "Little Li" (Xiaoli) in Chinese. The two Tangut characters B1 and B2 phonetically transcribe the Chinese family of Xiaoli Qianbu. However, the Yuan History records the family name as Xili 昔里 (MSM xī lǐ, OM ꡛꡞ ꡙꡞ si li), and Cheng Jufu (1249–1318) records the name as Xili 昔李, which does not accord with this story. The Historical Records of the Mongols and the New Yuan History explain this difference by saying that Xiaoli was the original name, which later became corrupted to Xili, but this does not ring true to me. A more plausible explanation is that their family name was originally Tangut, pronounced something like Sili, and that after Xiaoli Qianbu moved away from Hexi he sinified it to the similar-sounding Chinese characters xiǎolǐ 小李, and invented the story of his ancestors being Shatuo Turks who had been given the Tang royal family name. I do not know of a Tangut surname that matches Xili, but 穿 [si²] is the first character in eight Tangut family names listed in Miscellaneous Characters (Zázì 雜字), and 螰 [li̭e²] is the second character in two Tangut family names listed in Miscellaneous Characters, so Sili would be a plausible Tangut family name. B3 "army" [nga¹] and B4 "to command" [mbi̭u²] together form a word meaning "army commander". The term is attested in other Tangut sources, for example in the Tangut translation of Sunzi (The Art of War), where it is used as one of the translations for "general" in Chinese. In the bilingual Tangut-Chinese glossary Pearl in the Palm 番漢合時掌中珠 (folio 28) there is an entry for the Tangut term 蒏穈煂, which is glossed in Chinese as 統軍司 "Bureau of Army Command". The Chinese phonetic gloss for Tangut "army commander" in the Pearl in the Palm is 遏暮 (MSM è mù, OM ꡖꡡ ꡏꡟ ꞏo mu). The phonetic reconstructions of the Tangut characters for "army" and "to command" by various modern scholars are shown in the table below. None of them are good fits for the Old Mandarin readings for Chinese transcription given in the Pearl in the Palm, which suggests that the Chinese language used in the Pearl in the Palm was not closely related to Old Mandarin. Xiaoli Qianbu 小李鈐部 or Xili Qianbu 昔里鈐部 (the subject of the Daming Stele epitaph). Xiao Qianbu 小鈐部, youngest son of Xiaoli Qianbu. Shunanyu Ganbu 束南玉紺部, a cousin of Xiaoli Qianbu (recorded in the Epitaph of Xili Bo). Asha Ganbu 阿沙敢不, a Tangut general mentioned in the Secret History of the Mongols, who is probably the same Asha, Darughachi of Suzhou, who was Xiaoli Qianbu's nephew—Xiaoli Qianbu's nephew is referred to simply as Asha in the Chinese text of the Suzhou Stele, but in the Uighur text he is called Asha Gambu. Yepu Ganbu 也蒲甘卜, a Tangut commander who surrendered with his troops to Genghis Khan in 1221 (Yuan History ch. 123). Shuosijiyi'er Ganbu 搠思吉亦兒甘卜 (Yuan History ch. 35). Tahai Ganbu 塔海甘卜 (Yuan History ch. 123). The various Chinese phonetic transcriptions of the Tangut word "army commander" are given in the table below, with Old Mandarin readings from the 14th-century Chinese Phags-pa rime dictionary Menggu Ziyun 蒙古字韻. Comparing the Old Mandarin readings in the table above with the modern reconstructions for Tangut "army commander", it is evident that the gān bǔ 甘卜 and gǎn bù 敢不 (gam bu) transcriptions are the closest. All of the modern reconstructions reconstruct the character for "army" as an open, unnasalized syllable beginning with /g/ or /ŋ/ and with an /a/ vowel, which matches the initial consonant and vowel of Old Mandarin /gam/. The final /m/ of /gam/ evidentally belongs to the following Tangut word, "to command", which in Sofronov's reconstructions starts with a prenasalized stop /mb/. Sofronov is the only Tangut scholar to reconstruct the character meaning "to command" with a prenasalized stop, but the evidence of the Chinese transcriptions seems to me to provide very strong evidence that he is correct. On the other hand, his reconstruction of the initial of "army" as a velar nasal is not supported by the Old Mandarin readings. Based on the Old Mandarin evidence, it would seem that the Tangut word for "army commander" was pronounced something like as /ga mbu/ in the early 13th century. But if "army commander" was pronounced gambu, then how can we explain the Old Mandarin reading of kempu for Qianbu in Xiaoli Qianbu's case? Looking back at the list of people with "army commander" names, we can see that only Xiaoli Qianbu and his son have a Qianbu name, whereas the other five people (including Xiaoli Qianbu's cousin and nephew) all have Ganbu names, suggesting that the Qianbu transcription of "army commander" was idiosyncratic to Xiaoli Qianbu. The explanation is, I believe, that Qianbu is a phonetic approximation to the Tangut word "army commander" that also acts as an approximate Chinese translation of the Mongolian title Darughachi. Xiaoli Qianbu and his son, Xiao Qianbu, were both Darughachi of Daming Route, and many Tangut army commanders ended up as military or civil Darughachi under the Mongols. Thus the Mongolian position of Daughachi may have been seen as equivalent to the Tangut position of army commander, and Xiaoli Qianbu may have deliberately phonetically mistranscribed Tangut "army commander" so that it meant Darughachi in Chinese. Indeed, if we accept that Xiaoli Qianbu's family's original family name was Xili, which he later changed to Xiaoli, then the change from Ganbu to Qianbu may also be seen as an attempt to sinify his name. Thus, we can hypothesise that Xiaoli Qianbu changed his Chinese name from the meaningless transcription Xili Ganbu 昔里甘卜 to the more elegant and Chinese-sounding Xiaoli Qianbu 小李鈐部. How then is Qianbu a translation of Darughachi? The word Darughachi (Mongolian daruɣači ᠳᠠᠷᠤᠭᠠᠴᠢ) is formed from the word Darugha (Mongolian daruɣa ᠳᠠᠷᠤᠭ᠋᠎ᠠ; Phags-pa daruqa ꡊ ꡘꡟ ꡢ) with the person-forming suffix -či. Darugha seems to have the same meaning as Darughachi, so in Mongolian Phags-pa monumental inscriptions such as the 1276 Edict of Mangala the Phags-pa word daruqas ꡊ ꡘꡟ ꡢꡛ (plural of Darugha) is translated as 達魯花赤 "Darughachi" in the corresponding Chinese text. Darughachi is a Mongolian term that literally means the "one who presses," in the sense of affixing a seal, hence the chief official of an office. Under the Yüan systen, the darughachi were placed above titular official of many central and local government offices. Their function was mainly supervisory rather than executive. With few exceptions, only Mongols and the se-mu were qualified to serve as darughachi. The Mongolian darugha or darughachi is derived from the root daru, which means to press or suppress, and could be interpreted as oppressor. Semantically, the Turkish equivalent of darughachi is basqaq; the Arabo-Persian version is shaḥna. For the present discussion, it is largely academic whether Darugha is an ancient word ultimately derived from the Chanyu of the Xiongnu or whether it is a native Mongolian word derived from the verb "to press", because what concerns me is what Xiaoli Qianbu thought it meant. I have been unable to find any contemporary discussions of the meaning of Darughachi in Chinese sources, but I think we can assume that the Mongols of the time either knew that Darugha was a reflex of the verb "to press", or, if it was an ancient word meaning "tribal chief", it is quite likely that they would have created a folk etymology for it based on the verb "to press". Either way, a literal Chinese translation of Darughachi would reflect Mongolian daru- "to press". Turning to the Chinese word Qianbu, we find that the first character, qián 鈐, does indeed mean "to stamp a seal", and the second character, bù 部, means "department", so Qianbu literally means "Department for stamping seals" in Chinese. This is not an exact translation of Mongolian Darughachi, nor is kempu an exact phonetic transcription of Tangut "army commander", but it is very cleverly an approximate translation of a Mongolian word at the same time as being an approximate phonetic transcription of a Tangut word. 蚋習 [ndon² khwei²] "big sister"
The character also occurs by itself with the meaning of "official" in the Law Code for the Celestial Prosperity Era 天盛律令. Nie Hongyin 2006 suggests that the single-character word originally meant "tribal chief", and it was extended to refer to officials due to the cultural and linguistic influence of Khitan, and was related to the Khitan-Jurchen-Manchu use of the word "big" to mean "official" or "mandarin" (Amban). Thus, on the Daming Stele epitaph we can read the character B5 "big" to mean "great man" = "official". Yuan History 元史, commissioned by the first Emperor of the Ming, the Hongwu Emperor, and compiled in 1370 (see below for translation of relevant sections). Historical Records of the Mongols 矇兀兒史記 by Tu Ji 屠寄 (1856–1921), first published in 1934. New Yuan History 新元史, compiled by Ke Shaomin 柯劭忞, first published in 1922. I have not had access to the original sources for these epitaphs, but have relied on excerpts given in Aotegen 2004 and Wang Ting 2009. Epitaph for Xiaoli Qianbu, recorded in the collected works of Wang Yun 王惲 (1227–1304) (秋澗先生大全文集 vol. 51). Titled Spirit-Way Stele Inscription for Li Gong, the Late Imperial Envoy for Daming Route 大元故大名路宣差李公神道碑銘, but also referred to as Spirit-Way Stele Inscription for Li Yilishan 李益立山神道碑銘. Epitaph for Li Ailu (eldest son of Xiaoli Qianbu), recorded in the collected writings of Yao Sui 姚燧 (1238–1313) (姚燧集 or 牧庵集 vol. 19). Titled Spirit-Way Stele Inscription for Zhongjie Li Gong 忠節李公神道碑銘, but also referred to as Spirit-Way Stele Inscription for Li Ailu 李愛魯神道碑銘. 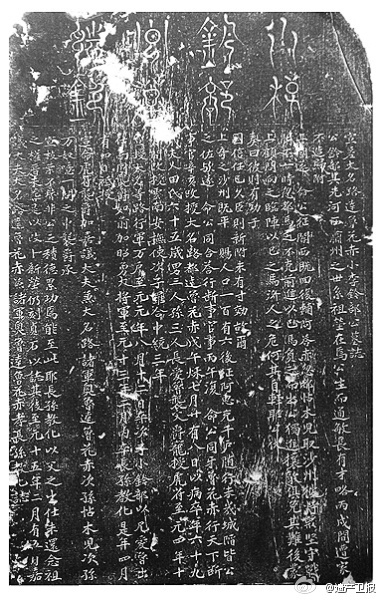 Epitaph for Li Ailu (eldest son of Xiaoli Qianbu), on a stele discovered in Daming in March 1990. I have not found a transcription or detailed description of this epitaph anywhere. Epitaph for Li Jiaohua (grandson of Xiaoli Qianbu), written in 1308, and recorded in the collected writings of Cheng Jufu 程鉅夫 (1249–1318) (程雪樓文集 vol. 25). Titled Account of the Ancestors of the Duke of Wei 魏國公先世述, but also referred to as Account of the Ancestors of Li Jiaohua 李教化先世述. Epitaph for Asha (nephew of Xiaoli Qianbu), in Chinese and Uighur, on a stele erected in 1361 that was discovered in 1962 at Jiuquan, Gansu. Titled Stele for the Great Yuan Hereditary Grand Darughachi of Suzhou Route 大元肅州路也可達魯花赤世襲之碑, but also referred to as the Asha Hereditary Stele 阿沙世襲碑 or simply the Suzhou Stele 肅州碑. The Chinese version of the epitaph is engraved on the front of the stele, and the Uighur version of the epitaph is engraved on the back of the stele. Epitaph for Yeshu Puhua 野述普花 (great grandson of Xiaoli Qianbu), recorded in the Zhengde Era Records of Daming Prefecture 正德大名府志 (vol. 9). Titled Tomb Epitaph for Yeshu Puhua 野述普花墓誌銘. Epitaph for Xili Bo 昔李勃 (great great grandson of Xiaoli Qianbu's uncle), composed by Ouyang Xuan 歐陽玄 (1283–1357), and recorded in the Zhengde Era Records of Daming Prefecture 正德大名府志 (vol. 9). Titled Tomb Epitaph for Xili Bo 昔李勃墓誌銘. Aotegen 敖特根, "西夏沙州守将昔里钤部, in Journal of Dunhuang Studies 2004.01. Guillaume Jacques, "A Note on the Etymology of the Tangut Name Ngwemi", in Journal of the American Oriental Society 2010, 130 (2): 259–260. Liu Guangrui 刘广瑞 and Zhu Jianlu 朱建路, "大名新出夏汉文合璧墓志铭的价值和意义", in Guangming Daily 2014.05.21. Nie Hongyin 聂鸿音, 释“大”, in Xixia Studies no. 1 (2006.10): 21–25. Shi Jinbo 史金波, "河北邯郸大名出土小李钤部公墓志刍议", in Hebei Academic Journal 2014.04. Wang Ting 王颋, "元代大名路达鲁花赤唐兀人昔李氏世系考, in Journal of Beifang Ethnic University 2009.01: 5–13. Zhao Shuhua 赵书华, "大名出土元代夏汉文墓志引国内众多专家惊艳争锋", in Yanzhao Metropolis Daily 2014.04.04. If the Tangut or Phags-pa transcriptions on this page do not render correctly (missing glyphs and/or incorrectly positioned diacritical marks), please install the BabelStone Roman font, which is designed to cover all characters required for Tangut and Sinological transcription purposes.